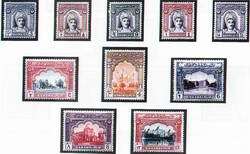 The Bhawalpur state issued the stamps up to 1949.The stamps of Bhawalpur used only on the post within state but all foreign mail was sent through Pakistan Post. Apart from the list provided here many unissued stamps are in the market. But these stamps are not part of our catalogue. For detail history of Bhawalpur Postage Stamps please refers the Following book. The above stamps No. 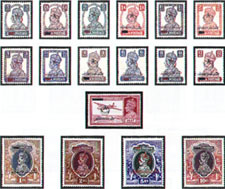 B2, B4, B6, B8, B9, B11, B12, B15 ,B16, B 17 and B18 were overprinted in Red colour while B 3, B5, B7, B10, B13, and B14,were overprinted in Black colours. Warning: Collectors should consult experts before purchasing these issues to avoid forge prints. Q. 0.500 Ml N. 50 ( 10 x 5) Stamps Imprint on lower margin in the centre of the sheet. Imprint on lower margin in the centre and plate No. twice on the lower margin of left corner of the sheet. Q. 0.500 Ml N. 50 ( 5 x 10) Stamps Imprint on lower margin in the centre of the sheet. Imprint on lower margin in the centre and plate No.1 twice on the lower margin of left corner of the sheet. Imprint on lower margin in the centre of the sheet .Opt ‘ Sarkari’ in black colour. Imprint on lower margin in the centre and plate No. on the lower margin of left corner of the sheet. Revenue Stamp of 1933 was overprinted Sarkari in red colour in small size and in black colour in large size. Imprint on lower margin in the centre and plate No. twice on the lower margin of left corner of the sheets.